The new eight-member Barr Ministry. 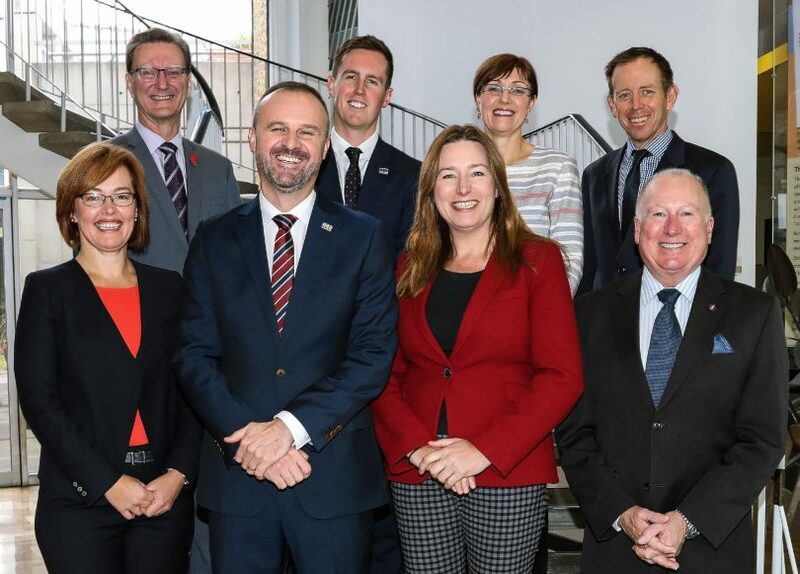 From left: Meegan Fitzharris, Gordon Ramsay, Andrew Barr, Chris Steel, Yvette Berry, Rachel Stephen-Smith, Shane Rattenbury, and Mick Gentleman. Photo: Supplied. 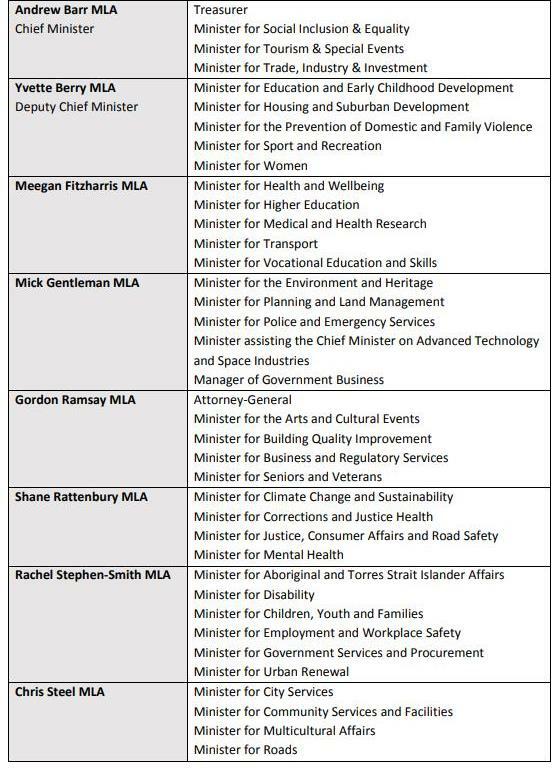 The key portfolio of Transport and City Services has been split and new ones of Building Quality Improvement and Government Services and Procurement created in the ACT Ministerial reshuffle, forced by the decision to expand the Ministry to eight. Chief Minister Andrew Barr has also sharpened the focus on diversifying the ACT’s economy with the creation of the Medical and Health Research and Advanced Technology and Space Industries portfolios to encourage investment and jobs in these sectors. The new and eighth Minister Chris Steel will take on City Services, including responsibility for roads, as well as Multicultural Affairs and Community Services and Facilities, while Gordon Ramsay will add Building Quality Improvement to his responsibilities and Rachel Stephen-Smith will take on Government Services and Procurement, and the contentious area of Urban Renewal, which has been taken off Planning and Land Management Minister Mick Gentleman. Mr Gentleman will assist the Chief Minister on Advanced Technology and Space Industries, focusing on agricultural and environmental sciences, cybersecurity and defence, renewable energy industries and space, while retaining Environment and Heritage and Police and Emergency Services. He will stay on as manager of Government business. Meegan Fitzharris will now focus on driving the Territory’s big public transport changes, with light rail and a new bus network, while retaining Health, and adding Medical and Health Research, while also looking after vocational and higher education. Deputy Chief Minister Yvette Berry retains all her responsibilities with Mr Barr saying her next major piece of work will be presenting the long-awaited housing strategy later in the year. “The Deputy Chief Minister Yvette Berry has been leading policy development on the next phase of ACT Government investment in public, community and affordable housing. We acknowledge that housing is crucial to the liveability of our city. With the largest renewal of public housing in the city’s history coming to an end, we are looking to the next stage of our housing reform, and the Deputy Chief Minister will detail this plan later this year,” he said. Mr Barr adds Social Inclusion and Equality to his economic portfolios, and said a priority would be to continue pushing for the repeal of the Andrews Bill that restricts the ACT Government from even considering assisted dying legislation. “I will also continue to focus on expanding national and international investment and trade opportunities for our growing industry base and creating more good jobs for Canberrans,” he said. Mr Barr also moved to address concerns about building quality, particularly in the capital’s booming apartment sector. “The ACT Government has introduced strong reforms to crack down on dodgy builders and developers in the Territory. Canberrans should have confidence that any new property purchased in the territory adheres to Australian building quality standards,” he said. The Chief Minister said Ms Stephen-Smith would support the Territory’s transition to the National Disability Insurance Scheme as the Minister for Disability, and the Minister for Children, Youth and Families. She would also oversee key urban renewal sites such as the Yarralumla Brickworks, in what is a flashpoint issue as infill continues amid concerns about development and its impact on the ACT’s green spaces. Mr Barr said that in Government Services and Procurement, Ms Stephen-Smith would focus on the implementation of the ACT’s Local Jobs Code and be responsible for Worksafe ACT to ensure the ACT had the strongest protections for workers’ pay and conditions on public projects in the country. The sole Greens MLA in Cabinet, Shane Rattenbury will continue in his current portfolio areas. “The National Energy Guarantee may be dead, but we plan to continue the ACT’s national leadership in the transition to a low carbon economy. Minister Rattenbury will work on new projects to help the Territory achieve our target of zero net emissions by 2045,” he said. Mr Barr said Mr Steel was passionate about the renewal of the Woden Centre, and would lead the Government’s efforts there through its renewal projects and new community facilities. He said Mr Steel’s appointment to the Ministry meant that every electorate was represented in the Cabinet. “The expanded Ministry will strengthen our focus in the areas that matter most to Canberrans, and give us the capacity to focus on emerging priorities as our city continues to grow,” he said.